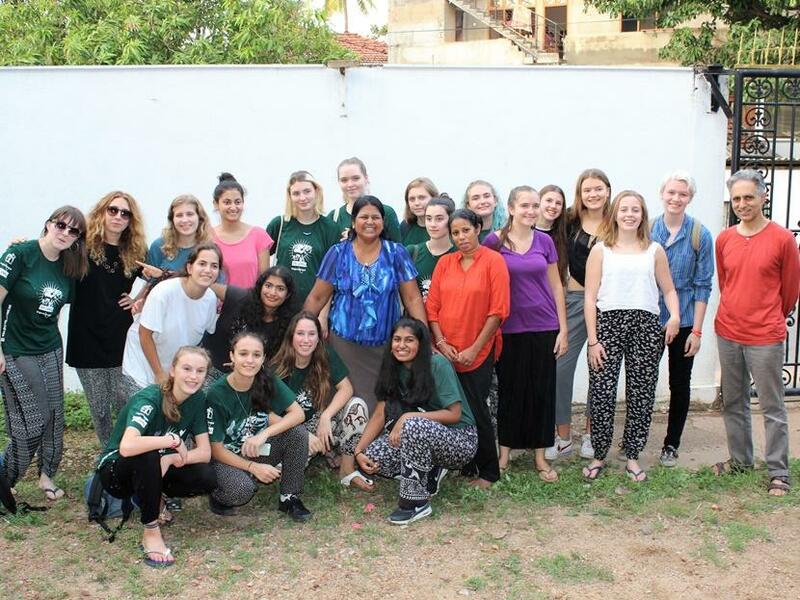 None of us could believe our luck when Projects Abroad visited our school offering us the incredible opportunity to travel to Sri Lanka on a volunteering mission. 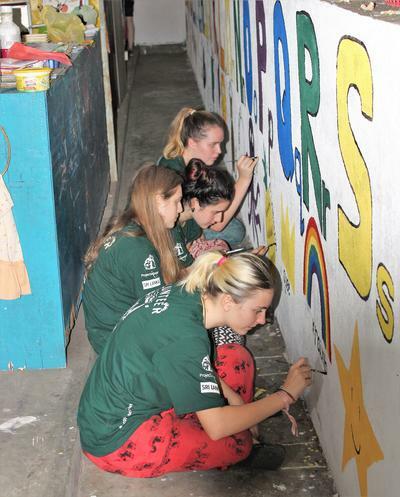 The chance to lead lessons in pre-schools, teach English at a community centre and unleash our (questionable) artistic talents on various school walls was one I certainly couldn’t pass up. The first step was to each individually fundraise £150 to put towards our trip. After a few brainstorming sessions and ideas from Projects Abroad, we all had a money-raising game plan and unshakable determination. People hit their fundraising targets in a variety of enterprising ways, ranging from sponsored triathlons to busking on the steps of St. Paul’s Cathedral. I decided to reach my £150 goal by selling programmes at the Lord Mayor’s Parade and holding bake sales in my local park. Time flew by, and suddenly it was the day before departure, our cases were all jam-packed with insect repellent, flip-flops, and all the art & crafts supplies we could get our hands on. We were sucked into the Sri Lankan culture almost immediately after we left the airport, getting stuck in traffic due to a Buddhist parade happening along the side of the road, complete with flame dancers and a costumed elephant that of course we had to jump off the coach to get a closer look at. Our first day in Sri Lanka featured a trip to the stunning Buddhist Peace Pagoda and dodging waves on Jungle beach. 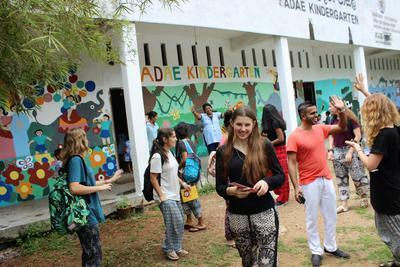 Accustomed to the heat, we were hugely excited to begin volunteering the next day. 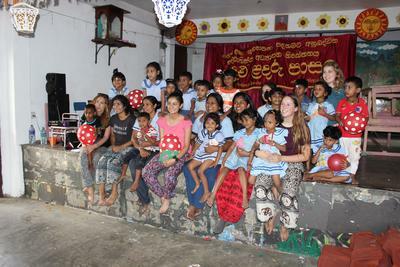 I chose to volunteer at Sambaudhaloka pre-school which, although it is only one room, has a register of over 70 children. 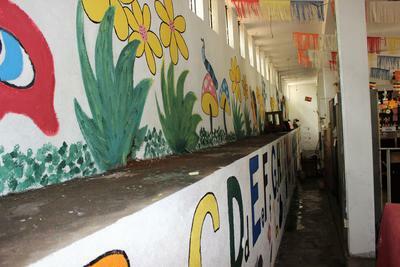 The children welcomed us with grinning faces and handmade flowers; the supportive teachers handed the lessons entirely over to us. For the duration of our stay, we taught the children about their community leaders, our aim being to have so much fun with them they barely realised how many new English words they were learning. We prepared our lessons every day after lunch, sat outside together in the sunshine illustrating flashcards with English words on, cutting out police badges for the children to colour in or thinking up fun games to play that linked to the job of a ‘garbage man’. Their favourite words to learn were ones accompanied by fun sound effects; nothing beats having a crowd of eagerly children yell ‘nee naw nee naw’ every time they hear the word fire engine. On top of exposing them to English, we taught them every nursery rhyme we knew, as well as washing their hands with them every day before lunch to ensure good personal hygiene became second-nature to them all. Sambaudhaloka pre-school has a lovely tradition of letting children wear princess dresses to school on their birthdays, a tradition we have been trying to convince our headmistress to adopt at our school! 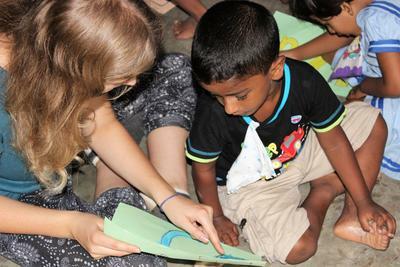 It seemed challenging to us at first that we would be teaching children who spoke Sinhala; the language barrier appeared to be a tall one. However, we quickly taught ourselves a few useful phrases such as “lamay” which means children and “lassanai” which means beautiful; a few of us even learnt how to count up to thirty. We found the most useful tool of communication to be smiling, stickers and high-fives. However there was always Projects Abroad member with us in the classroom so there was no need to worry. Our weekend trip to Kandy was jam-packed full of new experiences. We washed the backs of elephants with coconut husks, held 4-week old turtles in the palms of our hands and put our haggling skills to the test. We spent our afternoons split between a community centre where we taught English to older children and local schools in need of some love. Luckily we had a Sri Lankan delicacy - King Coconuts - which provided the necessary refreshment to keep us going through hours of outlining the alphabet and painting the walls white again. At the community centre we split the children into groups by ability; this meant we could teach beginners the alphabet, work with slightly older children on phonetics to improve their reading ability and explain some more complex sentence structures to advanced level children. However, whatever their ability they were all hugely enthusiastic and eager to learn. Bags packed, Arts and Crafts supplies replaced by spices and ‘Chit Chats’, we headed home. The teachers’ gratitude for our work still inspires me to keep volunteering and the children we taught will always hold a special place in our hearts.